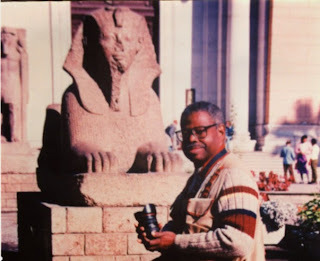 Dr. Yosef A. ben-Jochannan is the child of Julia and Krastan Jochannan and is married to Gertrude M. England. He is the father of 18 children. His education commenced in Brazil and continued in the U.S. Virgin Islands (St.Croix) and Puerto Rico. He received a Ph.D. in Cultural Anthropology in Cuba and a second doctorate in Moorish Hisory in Spain in addition to a law degree. He is also an Architect. He practices law in Puerto Rico and worked as a Civil Engineer in Puerto Rico. His professorships include tenures at Al Azar University in Cairo, Egypt and Cornell University in New York. They reflect only the tip of the iceberg. Geographically, he has taught in universities in Africa, the Caribbean, North America and South America. An expert on International Affairs, Dr. Ben's experiences include more than 50 years in Archaeology in Egypt. For 25 years dating back to 1945, he was the Chief of the African Desk of the United Nations Education Scientific Cultural Organization (UNESCO). In this capacity he dealt with cultural, anthropological, historical and archaeological matters. In 1957, he was the civilian advisor to the Permanent African Missions to the United nations. Dr. Ben has authored more than 28 published books and more than 16 unpublished books. He has also compiled a multi-volume encyclopedia in Africa.